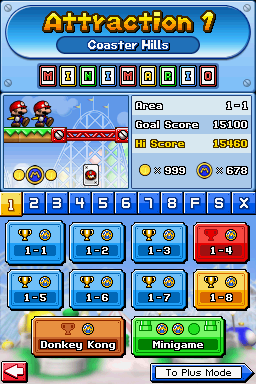 Coaster Hills is the first attraction in Mario vs. Donkey Kong: Mini-Land Mayhem!. It starts off as Mario and his Mini Marios begin their adventure to save Pauline. The only enemies found here are Shy Guys and Circus Kongs. A roller coaster can be seen in the background. Besides Mini Marios, another mini can be found here, Mini Toad. The levels consist of Ground Tiles for the floor, girders, and Spikes as obstacles. In their first encounter with Donkey Kong, the Mini Marios must avoid the barrels thrown by the ape, use ladders and girders to reach a switch near DK and press it to damage him. 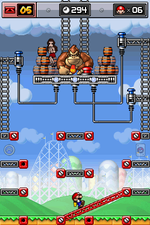 The player has to repeat this technique three times to defeat Donkey Kong, who takes Pauline and flees to the second attraction. The music played in this attraction is remixed music from Super Mario Bros. 2. The theme played in the levels is a remix of the overworld theme, the music played in the DK level is a remix of the boss theme, and the music played after completing a level is a remix of the theme played after defeating a world boss. This page was last edited on November 22, 2018, at 19:05.